Is Astigmatism a Disease? Can it be corrected? Could astigmatism be inhibiting her learning? Astigmatism is often incorrectly thought of as an eye disease or eye health problem. It is simply a very common focusing problem that is caused by an irregularity of the curvature of the cornea (the front of the eye). Often in layman’s terms, the astigmatic eye’s curvature is compared to the shape of a football as opposed to a basketball. Astigmatism is a refractive error just like nearsightedness (myopia) and farsightedness (hyperopia). When light enters the eye, it is not evenly distributed on the retina. This causes your eyes to have blurry vision. Most people are born with some degree of astigmatism. Both children and adults can have it. In children, it can affect their school work and learning. The higher the amount, the worst the vision. You may just have it by itself, or in conjunction with nearsightedness and/or farsightedness. Some common symptoms of astigmatism include headaches, blurred vision both near and far, eye fatigue, and eye strain. Can I have Astigmatism and not know it? Vision screenings, especially school screenings, often do not catch small amounts of astigmatism. It may only be found during a comprehensive eye examination. The reason is because there may be such a small amount and the person doesn’t realize that he/she is not seeing the best they can. Astigmatism is very treatable with glasses, contact lenses, LASIK, Clear Lens Replacement, Bladeless LASER Cataract surgery and high tech lens implants. If you have astigmatism, it is very important to consider it during the cataract surgery decision process. It can be corrected during upgraded cataract surgery and give you clearer, more crisp vision. Your choice of standard vs upgraded cataract surgery cannot be changed after the surgery. That is the reason it is a decision that should be carefully considered before surgery. Even those with nearsightedness and farsightedness have more vision correction options than ever before. This makes the decision process for cataract surgery more important than ever. Be sure to ask your eye doctor during your eye exam if there are recommendations relating to astigmatism correction for your eyes. Call 1-866-865-2020 for a comprehensive exam appointment. Most parents are well aware of the long term benefit of polarized sunglasses in protecting their own eyes from degenerative eye diseases and UV exposure. But many parents don’t realize how important it is to protect your children’s young eyes too.Just as your would always put sunscreen on your child when they are out in the sun, you should always put sunglasses on your child when in the sun as well. Sunglasses are literally sunscreen for your eyes. Typically before age 18, you get 1/2 of your life’s sun exposure, and before the age of 8 is when the most sun damage occurs. Even wearing a hat is not enough. Only 50% of the sun’s rays are blocked. 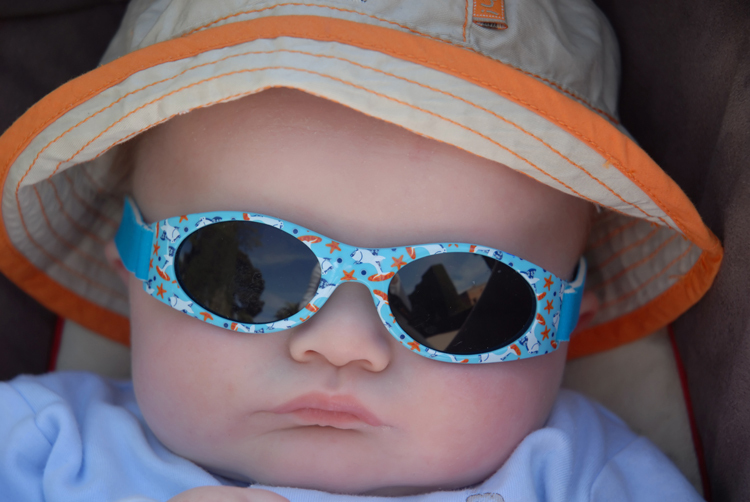 Kids should begin wearing sunglasses as young as 6 months old and they need to be good quality. Cheap sunglasses that don’t have UVA and UVB protection can actually be worse than wearing none at all. We recommend that children wear polarized polycarbonate lenses because of their safety as well as their inherent UVA and UVB protective properties. Choose sunglasses that block at least 99% of UVA and UVB rays. -Give your child guidance but let them pick out the glasses. They are more likely to wear them if they like the way that they look. -Always get children glasses and sunglasses with polycarbonate lenses. They are the safest lenses on the market and will give your child the best eye protection. -Wear sunglasses yourself. It is acts as a good role model as well as offering good protection for your eyes. -Consider buying an elastic head strap to make it harder for younger kids to take off the glasses. The Optical Gallery at The Eye Associates carries children sunglasses and can even order in more styles if you don’t find something that you like. Just stop by any of our locations and take a look.